Happy Thursday with Vino, The "O", a Speak Easy and More! Don't miss out on the weekly wine tasting at Cork and Bottle (3700 Orleans) about 5:00 pm in Mid-City - Taste some amazing wines. So, come sip, shop and pick up your favorite wine or liquor! You can also stop at Clever (right next door) for some happy hour specials after attending the free wine tasting. And be sure to stop by the Crescent City Farmer's Market (right outside the door) and patronize local Louisiana vendors with fresh veggies, seafood and more!! Need a little art, culture and music? You gotta go to the show at the Ogden Southern Museum of Southern Art (925 Camp St.) -better known as Ogden after Hours. The concert starts up at 6:00 pm with Micah McKee. Singer/Songwriter Micah McKee is a New Orleans native that combines influences from many different avenues to form a unique sound that melds folk, rock and indie pop.! Be sure to head on over to the bar for this month's signature cocktail the - O'Margarita! Remember if you're a member of the Ogden you always get in free! There's lots of fun going on over at Chickie Wah Wah (2828 Canal) tonight! WWNO's SpeakEasy - FREE and open to everyone (18 and over!) Join WWNO's General Manager Paul Maassen as he talks about the role of culture in our community with American Routes host Nick Spitzer, New Orleans musician and NolaVie contributor Edward Anderson, and Where Y'Eat host Ian McNulty - tonight at 6! Spotted Cat Music Club (623 Frenchmen) has a triple header with Sarah McCoy's Oopsie Daisies at 4:00 pm, Miss Sophie Lee at 6:00 and stay on and party with Jumbo Shrimp at 10:00 PM!! There's more fun on Frenchmen over at d.b.a. (618 Frenchmen) with the Tex-Mex sounds of The Iguanas at 7:00 pm with no cover!! And stay on for more great music with Ernie Vincents & The Top Notes ($5 cover) at 10:00 pm - you don't want to miss it!! A Fun Wednesday with Wine, A Benefit, Some Culture and Music! It's a Wednesday Wine Tasting over at Dijon (1379 Annunciation St.). Meet the winemaker and sample his awesome Napa Valley wines including Sauvignon Blanc, Rouge Blend, Zinfandel and Petite Sirah. These tasty wines are seductive, full-bodied on the palate and go well with a variety of foods, so come taste for yourself! Head on over to Frenchmen Street for a double header of music at d.b.a. (618 Frenchmen) - They've got an early show with the The Tin Men at 7:00 pm, and be sure to stay on for Walter "Wolfman" Washington and The Roadmasters at 10:00 pm - there's a $5 cover, but you know the Wolfman is worth it! Have fun in Mid-City when you head on over to Chickie Wah Wah (2828 Canal) for some happy hour drinks and stay on for Tom McDermott with Arsene DeLay at 7:00 pm. And at 9:30 p.m. Cary Hudson will be joined by Lisa Mills!!! Come get a sammich for lunch or early dinner - kitchen closes about 9 tonight. Looking for some dinner and then some music for dessert? Rock 'N Bowl (3016 S. Carrollton) can help you out! Get an entree' over at Ye Olde College Inn and then get a half price ticket to the show right next door at Rock N' Bowl....Tonight - it's the swingin' sounds of Swing-A-Roux at 8:30 pm!! Happy Weekend with Wine, Racing, Art, Movies and Oscars! Starlight Racing at the New Orleans Fairgrounds (1751 Gentilly Blvd.) - Groove on down to the sounds of the Groovy 7 and DJ Live! Gates open at 4:00 pm and the first post is at 5 p.m. The live bands take to the Clubhouse stage at 7 p.m., while the DJs in the Miller Lite Beer Garden spin nonstop until after the last race, about 9 p.m. If you haven't seen all the Oscar nominated films head on over to the AMC Theaters Best Picture Showcase at the Elmwood Theatre in Harahan. The theatre is having a marathon screening of all nine films nominated this year! The movies crank up at 10:00 am on Saturday and tickets are $40.00. Michalopoulos Gallery Opening (617 Bienville) Saturday, from 6:00 to 9:00 p.m. In celebration of "HEART SONG", the original James Michalopoulos painting used for the Official 2013 New Orleans Jazz & Heritage Festival poster. "Heart Song" captures Aaron Neville's two great inspirations -- New Orleans and spirituality - in this uplifting masterpiece. The exhibit will also feature studies and paintings used to create Michalopoulos' other Jazz Festival posters. James Michalopoulos will be in attendance. 2nd Annual Mad Scientist Ball: "Artwork, Absinthe & Alchemy" Collective World Art Community - Saturday from 8:00 until Midnight at The Big Top (1638 Clio Street). The event kicks off with a special mixology demonstration by one of New Orleans' very talented spirit handlers who will guide a group of aspiring alchemists as they create and sample a variety of specialty cocktails using chemistry sets provided by Collective World. Bring your own lab coat and don't forget your brass goggles! *Entertainment will be provided by our DJ, Bats in the Belfry and feature live performances by Sundog along with a costume contest for the best green fairy, the maddest scientist and the sexiest lab mouse. There will be a raffle and a silent auction with many great pieces of artwork, crafts, beautiful jewelry, handmade fashion accessories, dining certificates, hotels, gift cards, tickets for events and attractions and many other fabulous items contributed by artists and local businesses. *The proceeds from this event will benefit our project of bringing Giants in the City to the New Orleans Botanical Garden this fall. Start celebrating St. Patrick's Day a little early with The Downtown Irish Club Practice Parade!! It's Sunday from Noon to 5:00 pm at Markey's Bar (640 Louisa St.)...There's gonna be live music by The Mustard Brothers with Peeches, yummy food provided by Markey's Bar w/corn beef and cabbage added to the already great menu with raffle prizes every hour!! Erin go braugh! For more Oscar fun head on over to the Prytania Theatre Oscars Viewing Party - The local theater (5339 Prytania) rolls out the red carpet for an unofficial Oscar viewing party co-hosted this year by the New Orleans Film Society - doors open at 6:00 pm and the viewing starts up at 7:00 pm. The evening includes an Oscar trivia contest, a costume contest where attendees are invited to dress as a character from their favorite film! Tickets are $25 (and $20 for NOFS members). Need a little art, culture and music? You gotta go to the show at the Ogden Southern Museum of Southern Art (925 Camp St.) -better known as Ogden after Hours. The concert starts up at 6:00 pm with Chris Thomas King. King started his own independent production company and record label, 21st Century Blues. Soon after he found success as a film composer and actor. Winning three Grammy Awards by 2003 and several Country music CMA awards. He has developed a singular sound and style that transcends his blues roots from his years of performing before loyal fans at packed clubs, major festivals, theaters and juke joints. As an actor King has a role in the HBO series "Treme" and starred in the movie "O Brother Where Art Thou"! Be sure to head on over to the bar for this month's signature cocktail the - O'Margarita! Remember if you're a member of the Ogden you always get in free! There's lots of fun going on over at Chickie Wah Wah (2828 Canal) tonight! It's Trampled Under Foot - tonight about 8! And come early for Big Daddy O and the Voodoo Blues Krewe monthly meeting. Get you some BLUES!!!! There's more fun on Frenchmen over at d.b.a. (618 Frenchmen) with the Tex-Mex sounds of The Iguanas at 7:00 pm with no cover!! And stay on for more The Special Men ($5 cover) at 10:00 pm - you don't want to miss it and be sure to pick up a CD!! Happy Healthy Hump Day with a Night of Health, Culture & Music! Get your post Mardi Gras resolution a little kick with A Night of Health + Wellness at Pure Barre (701 Metairie Rd.) from 5:00 pm until 8:00 pm. It's the 1st Annual Health + Wellness Night in Old Metairie Village! The businesses in the community have joined forces to share with you our passion of health, lifestyle & wellness with everyone! Pop in to all participating businesses on this night and get a stamp on your healthy passport for a chance to win a big prize from all participating businesses, valued at over $500. Orthopedic & Sports Therapy of Metairie- Free orthopedic evaluation & giveaways! Massage Envy- Free Aroma Therapy or Sugar Foot Scrub enhancement to next session. Pure Barre - 20% off select packages, will have wine/snacks. Tonight is Chanson d’amour with Bon Operatit at the Four Points Sheraton (541 Bourbon)in the Puccini Bar from 7:00 to 8:30 pm. Join Opera on Tap for some love music at the Four Points Sheraton tonight. They'll be singing some of your favorite opera pieces plus a some of your favorite tunes to get you in the mood. So bring your friends and family to the Four Points Sheraton. Four Points Sheraton has a special valet parking rate of $5 during the concert when you mention the event. Have fun in Mid-City when you head on over to Chickie Wah Wah (2828 Canal) for some happy hour drinks and stay on for Tom McDermott with Meschiya Lake at 7:00 - it's a great evening of music! Looking for some dinner and then some music for dessert? Rock 'N Bowl (3016 S. Carrollton) can help you out! Get an entree' over at Ye Olde College Inn and then get a half price ticket to the show right next door at Rock N' Bowl....Tonight - it's the piano rockin' sounds of the Joe Krown at 8:30 pm!! Special performance this evening from the WAZOZO ZORCHESTRA at BACCHANAL (600 Poland)from 7:30pm until 10:30pm. Don't miss this exciting evening of the French Chansons with Helen Gillet's WAZOZO ZORCHESTRA including these amazing musicians!! Be sure to make a stop by the Spotted Cat (623 Frenchmen) early for this great line-up of music...Sarah McCoy at 4:00 pm, Dominick Grillo and The Frenchmen Street All Stars at 6:00 pm and be sure to stay on for the Krisitna Morales & The Bayou Shufflers at 10:00 pm! Happy Weekend with Wine, A Second Line, Brunch and More! Check out Friday Nights at NOMA this evening over at the New Orleans Museum of Art beginning at 5:00 pm and celebrate the weekend! The event is FREE with museum admissions. Tonight it's READING WITH BRAD AND JIM RICHARD: CURTAIN OPTIONAL. Tonight NOMA celebrates the exhibition Jim Richard: Make Yourself at Home with a reading by the artist and his son, Brad Richard. $10 Adults, $8 seniors, students, active military, $6 children ages 17 to 7, children 6 and under are free. And you thought the parades were over - No way!! There's a second line this weekend!! THE LADY JETSETTERS PRESENT JUST COOLIN' JANUARY JUMP & JIVE at NOON with guests SECOND LINE JAMMERS!! START FORMATION: Fox III Bar 3801 Washington Ave. @ S. Rocheblave St. - Out Washington Ave. to S. Dorgenois St. right turn @ S. Dorgenois St. Out S. Dorgenois to M.L.Kl Blvd. - Out M.L.K. Blvd. STOP #1 - (CLUB S&S/CLUB BALI) Out M.L.K. Blvd to Simon Bolivar right turn - Out Simon Bolivar to 1st St. - left turn 1st St. To Baronne St. right turn to Baronne St. to 2nd St. - Out 2nd St. to Danneel St.
STOP #2 - (SPORTSMAN'S CORNER) - left turn on Danneel St. - Out Danneel to 3rd St.
STOP #3 UPTOWN BAR-BEAN BROS.) - Out Daneel St. to 7th St. left turn 7th St. out 7th St. to Dryades St.
STOP #5- (GLADSTONE LOUNGE) - Out Dryades St. to LA Ave., CROSS LA. Ave. - left turn on LA. Ave. - Out LA. Ave to LaSalle St. - left turn LaSalle St. - Out LaSalle St. to Gen. Taylor St.
Stop#6-(SILKYS) - Out Gen. Taylor St. to S. Claiborne Ave. right turn S. Claiborne Ave. Out S. Claiborne Ave. to Washington Ave. left turn on Washington Ave. out to S. Rocheblave St. @ Washington Ave.
DISBAND: TAP II LOUNGE 2800 ROCHEBLAVE ST.
A message from the Ladies - REMEMBER: BE YOUR BROTHERS AND SISTER'S KEEPER, NOT THIER KILLER. LIVE RESPONSIBLY. LEAVE YOUR ATTITUDES, WEAPONS, AND PETS BEHIND!! THE LADY JETSETTERS THANK THE JAZZ & HERITAGE FOUNDATION, NORMAN DIXON FOUNDATION, JETSETTERS BROTHERS, SUPPORTERS & NEIGHBORHOOD BARS. Saturday night it's The New Orleans Nightingales at Preservation Hall (726 St. Peter) from 8:00 pm - 11:00 pm!! It's going to be a magical evening with these lovely ladies - Featured vocalists are Meschiya Lake, Lena Prima and Ingrid Lucia. There's a triple header over on Frenchmen Street at The Maison (508 Frenchmen) with the The Ben Slater Group at 4:00 pm, Smoking Time Jazz Club at 7:00 pm and the Russian sounds of Debauche tops off the evening at 10:30 pm. Nothing like some Bloody Marys and some great music! And there's more great brunch and food over on the Avenue at the Columns Hotel (3811 St. Charles Ave.) with guitarist Chip Wilson...I'm sure he'll be singing about gin and mimosas!! There's an early and late show over at Three Muses (536 Frenchmen) - come early for the French sounds Raphael Bas & Norbert Slama at 5:30 and stay on for Debbie Davis at 9:00 pm! Delicious food and great music!! 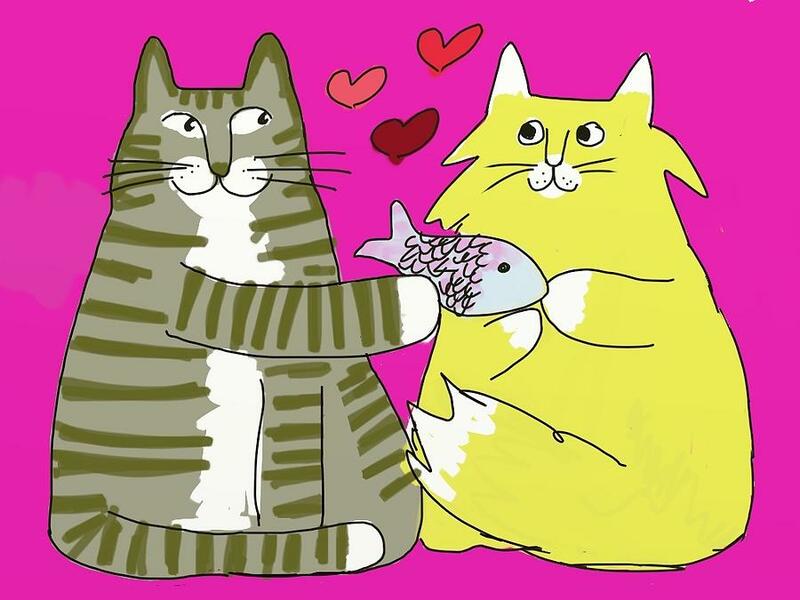 It's a lovely Thursday - Happy Valentine's Day!! Start you're evening off with some romantic vino!! Don't miss out on the weekly wine tasting at Cork and Bottle (3700 Orleans ) about 5:00 pm in Mid-City - Taste some amazing wines. So, come sip, shop and get your wine and purchase your favorite wine for 10% off! You can also stop at Clever (right next door) for a great Valentine's Day cocktail after attending the free wine tasting. Special Valentine's Day Flite Nite at Swirl Wine Bar (3143 Ponce de Lone) so start your evening with a bubbles flite at the bar! Try four delicious sparklers including the staff favorite Jean Velut Brut Champagne for $15. Don't feel like a full flite of bubbles? Just add the Jean Velut or any of the featured bubblies into a flite of your choice! We'll also have chocolate plates available with 3 different selections from Bittersweet Confections for $8. No reservations neccessary, just pull up a seat at the bar and pick up your boarding pass! They're starting at 5:30 just in case you have early dinner plans! It's a romantic evening of music at the Ogden Southern Museum of Art (925 Camp St.) - Ogden after Hours. The concert kicks off at 6:00 pm as the Ogden presents Dr. Valerie Francis and Dr. Wilfred Delphin. Dr. Valerie Francis performs locally, nationally and internationally. Leading roles to her credit include: Aida, Bess, Serena, Magda, Donna Anna, Donna Elvira, Musetta, Madame Euterpova, Madama Butterfly and Carmen. Dr. Wilfred Delphin is one half of the internationally renowned piano duo Delphin and Romain, which debuted in 1977 at Carnegie Hall! Tonight the O BAR's celebrates February with the O-Margarita! *Remember with your Ogden membership all of these excellent concerts are FREE!!! And....my hubby Bill deTurk will be doing the interview today - so you definitely don't want to miss it! It's a Valentine's House Party y'all - with Keith Burnstein and Lynn Drury! They've been having so much fun playing duo shows around NOLA and the Gulf Coast that we decided to share the love on Valentine's Day. So join them at their friends, Jake and Allisyn(and Camille)'s house, for a great night of Lynn and Keith originals, played in an intimate setting (1316 Joliet Street). They'd love to see you there! Doors at 7pm - Concert will be two short sets starting at 8pm SHARP. Please bring $10 suggested donation for the artists and a snack or drink of your choice. It's a potluck house party yall! 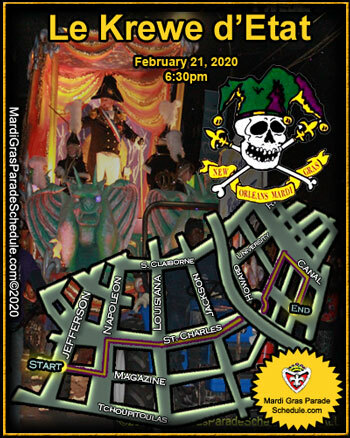 The Krewe of Hermes kick off the parades Uptown at 6:00 pm!! The founding fathers of Hermes were local businessmen who formed and incorporated their organization in 1936. The first ball and parade were held in 1937. As per tradition, the Hermes captain leads the procession in full regalia on a white horse. 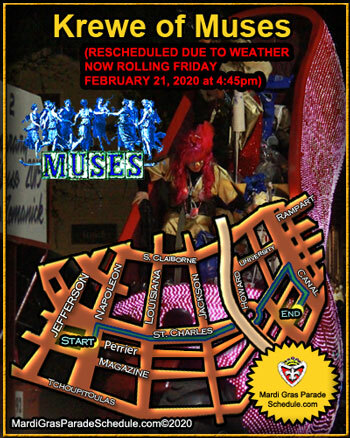 Often named one of the most beautiful carnival parades of the season....you don't want to miss this one! 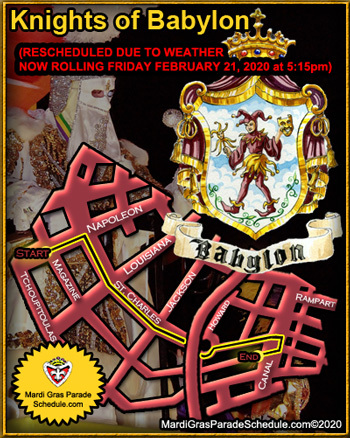 Le Krewe d'Etat rolls at 6:30 pm...The highly satirical krewe keeps its theme secret until the parade rolls. The name is a pun on "coup d'etat", which is the takeover of a ruling party by an outside force. The krewe "heeds only edicts from their Dictator, whose identity is never revealed." The organization's most coveted throw is a strand of glow-in-the-dark beads with green eyeballs. The famed Budweiser Clydesdales will lead the parade up the longer Uptown-to-Downtown route, an idea initiated by the D'Etat captain. 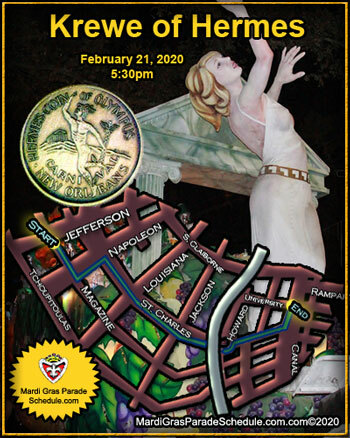 Nearly a dozen marching bands (St. Augustine, Brother Martin High School, Citadel's Summerall Guard, Central Lafourche High School, the St. Charles Streetcar Band and others) are also scheduled to provide musical accompaniment as the parade sojourns through town. The identity of the "Dictator," as the D'Etat monarch is known, is never revealed. He will ride on his own signature float, followed by the Dictator's Banana Wagon, the High Priest float and others. 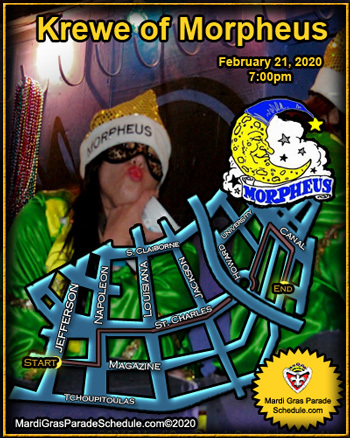 Established in 2000, the Krewe of Morpheus is named for the god of dreams and follows d'Etat at 7:00 pm! 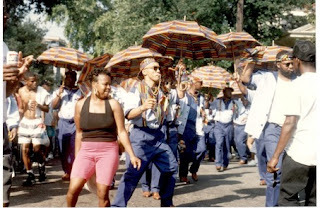 The krewe strives to be both inclusive in membership as well as provide parade goers an 'old-school' parade experience. 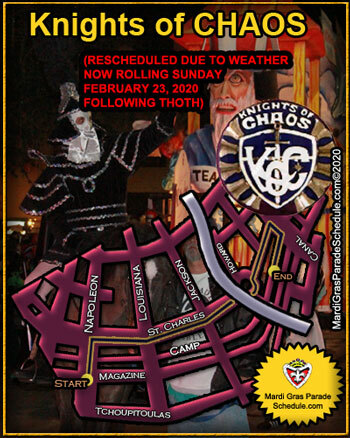 Morpheus is one of the largest co-ed krewes in the area and kicks off the long weekend leading up to Mardi Gras. And after the parades you got music!!! At the Howlin' Wolf (828 S. Peters) every night after the parades thru Lundi Gras!! Check out the line-up! Happy Monday - Hope everyone survived the Super Bowl activities now it's on to more Carnival time!! 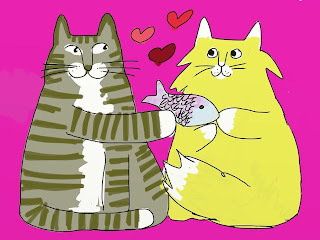 Throw Me Something Local: Awards Banquet & Art Show - By Bywater Art Lofts (3725 Dauphine St.) tonight from 6:00 to 9:00 pm. The Carnival season explodes with a February art show! I Heart Louisiana, an organization dedicated to preserving the ecological and economic health of Louisiana's people, culture, and wildlife, will be this month's host. It provides low-priced, high quality & locally produced parade products that strengthen the community by creating jobs and preserving cultural heritage. Artists will have on display Mardi Gras-themed masks, costumes, paintings, sculptures, and parade throws (and that's just the tip of the iceberg!). Food will be provided by Hollygrove Farm and Holly Tamale. The show is sponsored by I HeartLouisiana.org, HBO, Stay Local, DancingMan504, Galeria Alegria, Green Project, Bon Castor, Krewe of Chewbacchus, Bearded Oysters, All Things Local Radio WGSO 990, Life City, Hollygrove Market & Farm, Dirty Coast, Louisiana Bicycle Festival, Abita Mystery House, Bywater Art Lofts, Krewe of Kolossos, and Nola Voodoo Cakes. Sooooo........Come on out and definitely plan on having a stupid great time!!! There's good times in Mid-City over at Chickie Wah Wah (2828 Canal). They've got an amazing Monday night show with Phil DeGruy & Cloud Sharp 9 at 8:00 pm and come hungry the kitchen is open with good food from the Sammich! 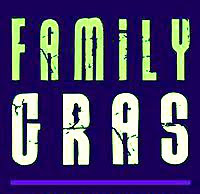 Super Bowl Fun with Bands, Oyster Eating and Family Gras!! All weekend long!! Verizon Super Bowl Boulevard: Woldenberg Park at 1 Canal Street. Admission is free. It's happening from 10 a.m. to 10 p.m. Featuring a lineup of local music artists, popular food and beverage offerings, live national television broadcasts, interactive fan events and the iconic larger-than-life Super Bowl Roman numerals. Free to the public, Verizon Super Bowl Boulevard will open today and runs daily until Super Bowl Sunday. Complementing the public entertainment, broadcast, and celebratory offerings on Super Bowl Blvd., fans of all ages will have opportunities to interact with numerous NFL and Host Committee partner events. 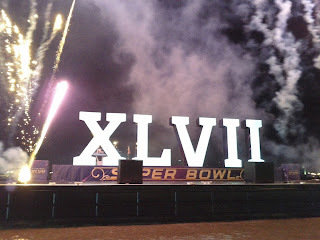 The main attraction, the larger-than life XLVII Roman Numerals, standing at 30 feet high and over 100 feet wide. Celebrate New Orleans' Perfect 10th Super Bowl with a true New Orleans-style festival! Yes - it IS a "Hot Beaver" Oyster Eating Challenge over at Grand Isle on Fulton!! Grand Isle’s “HOT BEAVER” challenge is Saturday!! The oyster competition kicks-off this Saturday at 11 a.m., and will pit 10 local New Orleanians against each other to slurp down a dozen raw oyster in two (2) minutes. 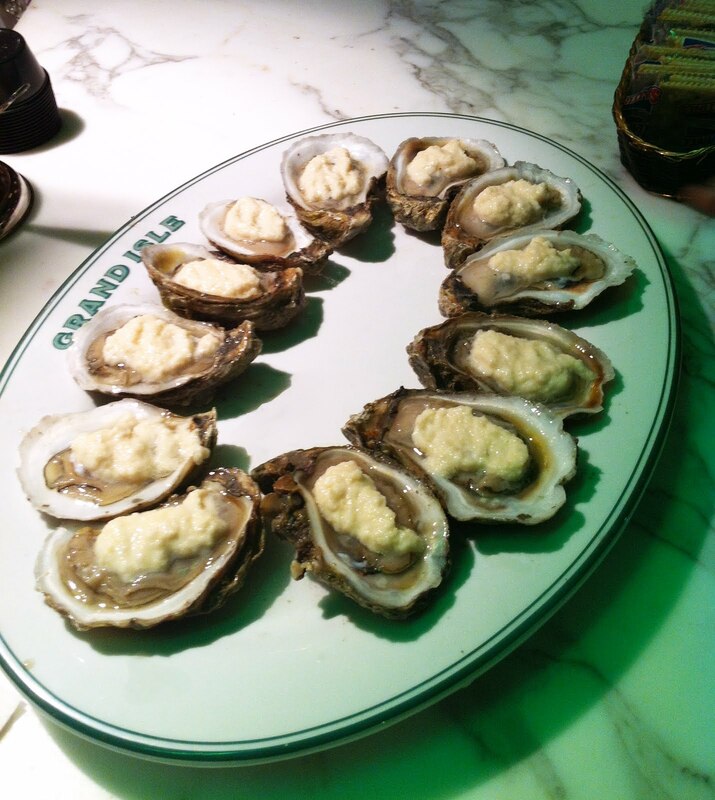 The catch is that each oyster will be topped with a half-teaspoon of Beaver Brand Extra Hot Horseradish! The promotion kicks-off this weekend, but will be ongoing in the restaurant moving forward -- so definitely an exciting promotion for locals and tourists alike. If the contestants are able complete the challenge, Grand Isle will cover the entire tab (oysters and beer) and throw in a grand prize … a t-shirt to announce their victory, along with the official title of GRAND ISLE BEAVER BUSTER. You don't want to miss this one!! WeFREE concerts, FREE Mardi Gras parades! Fabulous Flambeau Food Court & Beverage Zones, Kid-friendly activities - The Andes Rock Climbing Wall, the Bubble Blast (Walk & Play inside a giant hamster ball as it floats atop a pool of water), shop the Art Walk, and more. If you prefer an "up close & personal" experience with backstage access and premium stage viewing, access to VIP food & beverage, the VIP Royal Pass is available for purchase online at Ticketmaster.com for $99.00 per person. Pass is valid for both Friday & Saturday. Costuming encouraged...come out for Fun Friday wearing your carnival colors, and join us Sports Saturday wearing your favorite team colors! Alrighty, well that should keep you busy this evening...If you're looking for more fun stuff to do...check out the WWOZ Livewire - http://www.wwoz.org/new-orleans-community/music-calendar!! And be sure to tune in to WWOZ today from 11:00 am to 2:00 pm with my hubby Bill deTurk!! !